Golly! I can get paid to look like a teenage aerobics instructor, moonlighting as a prostitute circa 1992? Sign me up! Now all my dreams have come true. Squeeeeeee! EDIT [17 Oct]: Whoa! It has become clear to me that sarcasm is not easily expressed via the world wide web. Let's put some fears to rest: I would never, ever try out to be an American Apparel model. As much as I love their deep V's, leggings, and cardigans, I'm waaaay too conservative to model for them. I don't even show my midriff! What if they were to ask me to model something like this, this, or this (warning: none of these are even remotely safe to view at work). How 'bout you? 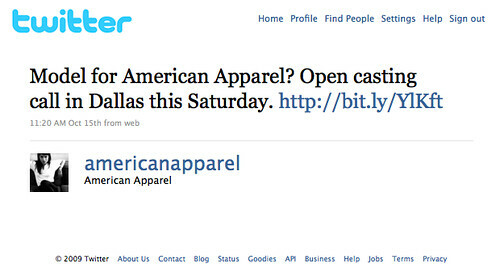 Would you ever try out to be an American Apparel model? No judgment, I swear!